Discussion in 'The South' started by batts65, Feb 15, 2008. 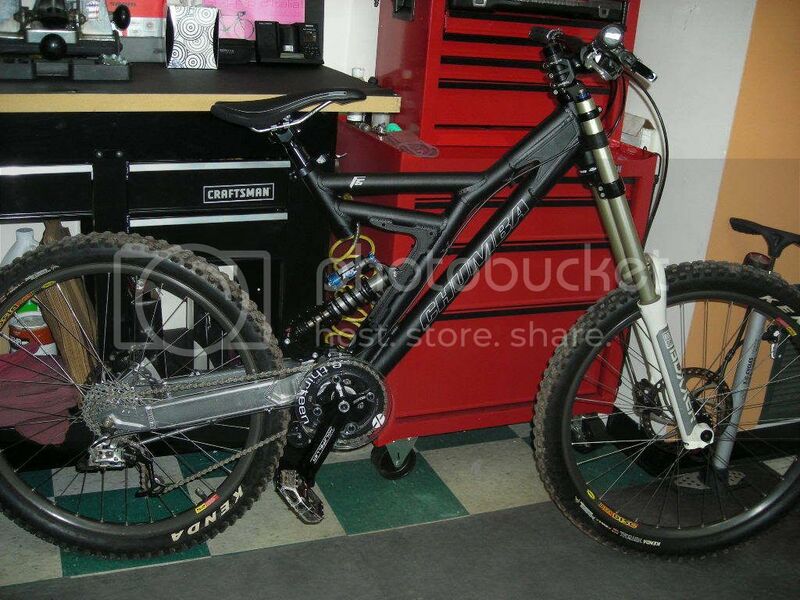 Bring my DH bike to Charlotte. Every year the wife and I visit friends in Charlotte at the end of March. I always bring my AM bike and hit up the local trails, which is great after a long upstate New York winter. My question is would it be worth it to bring the DH bike, I usually have a day or 2 where I could disappear for the day but I also do not want to drive 2 hours each way to get there. So, is it worth it or not... I will be there 3/26 through 3/31 if anyone wants to be guide for some DH runs. If you don't want to drive at least 1 1/2 hrs one way I'd leave it at home. BUT if you can disappear for a couple of days, you could hit Windrock which is some good ridin'. We drive from Charlotte every Sat. to the place Kenen mentions, 1.5 hours away, well there or a little farther west for a day trip. If you are up for something like that Id be willing to meet you in Charlotte and you could ride with us, and we could show ya some of the local goods. Mind you we do have downhill trails, but, all can be ridden on AM bikes, some are much more fun on a DH bike, I only ride a bigger travel bike cause its my only bike and the only one I can afford right now, but there is climbing on most of the rides so if your not down for peddlin a big bike you could still come ride DH on the smaller bike. So let me know and if you wanna do something like that I'll get ya my # and we can set sumtin up for that weekend. Do it .... bring the big bike ride with us. I ride a big bike up there also and the local trail in and around CLT. MTB_Rob_NC What do I have to do to get you in this car TODAY? I have a 5 and 5 bike, Chumba XCL. I usually ride Poplar, my wifes friends only live like 10 minutes from there. I would be willing to drive up to 2 hrs, sorry that is more what I meant. Would be nice to get out on Thursday or Friday, we will likely ride at the white water place on Saturday, already a commitment at this point. How far is Windrock from Charlotte, I thought it was like 4-5 hours away. Ether bike you bring you wil be fine up at Wilson's Crek about 1.5 hours from Charlotte. Johnboy and his crew are always going up there on the weekends. I try to make it once or twice a month. The place is super up and you get to get your Downhill on alone with a little bit of XC climbing (Not bad at all). It would be wearth while to go. I may have to check that out. 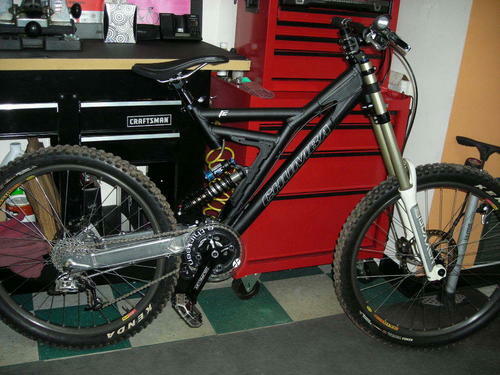 Just finished my DH bike so I am anxious to try it out. I will keep tabs on this thread and especially when it gets closer to the time of my trip down. RobP says it's all good on his AM machine....but what did he just buy? Unless you are headed up to Wilsons (2 hours) or Windrock (4 hours) I would just bring the 5x5. An AM bike does work fine in the hills, it's just funner/faster on a big bike. Like Johnboy said, there are some climbs. It is TRUE freeriding. (FR in my opinion includes climbing as well) Hook up with his crew and you will get the grand tour of WNC. Or as the Da-drop boys like to call it, XRFD...cross ride free downing. That is probably the best description of Western NC riding I have heard. the drive to Wilsons is 2.5 hours and you have a free ride up there with John Boy..I suggest taking the AM bike up there with them. I did Wilson's on my Sunday (36 front w/ road cassette) and was OK...but would rather have had a 2 ring setup. You don't get much of what they will be riding up where you're from since it's in the heart of the National Forest. And you're used to a heck of a lot rockier riding where you're from. Take the AM...and take Johnboy up on the lift to Wilson's. They show up on time. They show up on time. I also ride a 36 and road cass up there all the time ... not fun on the up but its ok.
Wilsons is the place, especially from Charlotte - it's only a 1.5 hour drive and one of the best rides as it offers some pedaling, epic trails, and some shuttle serviced DH too.